When the glitterati stream out of town and the Toronto International Film Festival draws the curtain on its 2014 edition, another kind of festival will kick into high gear not far from the teeming metropolis: the largest and oldest wine festival in Canada. 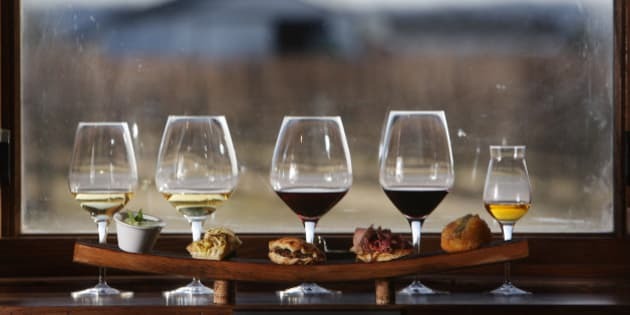 Visitors to the 63rd annual Niagara Wine Festival will learn about the region’s winemaking history through gourmet food, cheese and wine pairings, live entertainment, grape stomping competitions, and individual events hosted at wineries across the region. Award-winning winery Peller Estates, for instance, will feature a cooking demo on nitrogen-churned bacon ice cream, paired with an Ice Classic Cuvée. Peller Estates Winery was named the winery of the year at the 2014 National Wine Awards of Canada, for dominating the competition and snagging 13 medals. Despite being a modestly sized wine-growing area in southern Ontario, the Niagara Peninsula is a rich, fertile cradle for Canada’s wine industry and accounts for two-thirds of Canada’s grape production. Niagara sits on the same latitudinal band as Provence and Languedoc-Roussillon in France, the Chianti Classico region in Italy, and the Rioja region in Spain. The same latitudinal band also runs through Oregon State’s wine region, California’s Mendocino Valley and Washington State’s Yakima Valley. The festival will culminate in the annual Meridian Grande Parade, which this year commemorates the war of 1812 "Celebrating 200 Years of Peace." Ontario wineries host more than 1.9 million visitors a year. The Niagara Wine Festival runs September 13-28, 2014.